Rheumatoid arthritis (RA) is a chronic condition for which there is no cure. But even though the disease is progressive, newer disease-modifying drugs may actually be able to slow or even halt it getting worse. “We have many effective treatments for RA that help control the symptoms of joint pain and stiffness, but also prevent progression of the disease and the development of permanent damage,” says Lindsay Lally, MD, a rheumatologist at Hospital for Special Surgery in New York City. Early treatment for RA is key, because whatever joint damage has already occurred can’t be reversed. Find out how to recognize the symptoms at each stage of RA, and what can be done to treat it. In the autoimmune process of RA, the body mistakenly attacks its own joint tissue. “In early RA, the patient may not have many symptoms except for some stiffness in the early hours of the morning, primarily small joints — hands, the foot, sometimes the knees,” says Rajat Bhatt, MD, a rheumatologist at Allergy and Rheumatology Specialists of Houston. The stiffness gets better with movement, which differentiates it from osteoarthritis, the “wear-and-tear” degenerative kind. Dr. Lally says that antibodies in the blood, though, can be present for years before symptoms develop. In addition, “while X-rays at this time are usually normal, more sensitive imaging like ultrasound may show fluid or inflammation in an affected joint,” Dr. Lally says. Still, definitive testing for RA is difficult early on because although these inflammation markers may show up in blood tests, they might not, Dr. Bhatt says. Ultrasound also may or may not show anything unusual. In this latter, more severe stage, blood tests and imaging are less relevant for diagnosis because you can actually see the effects of the disease. “The joints start becoming bent and deformed, the fingers become crooked,” Dr. Bhatt says. These misshapen joints can press on the nerves and can cause nerve pain as well, he says. “In the older days we used to see more deformed joints when we did not have much treatment, but now we are seeing less and less,” Dr. Bhatt says. If not treated, the disease will progress to the last stage, in which “there’s no joint remaining at all and the joint is essentially fused,” Dr. Bhatt says. Luckily, with treatment, people with RA do not reach this stage. “You will know — your joints will tell you,” Dr. Bhatt says. “The pain will get worse and you could have more swelling.” Dr. Lally says that although periods of pain may resolve on their own in early RA, “these episodes tend to become more frequent and longer in duration until the classic features of RA persist.” In addition, Dr. Bhatt says to pay attention to non-joint symptoms like increased shortness of breath or red, painful eyes, which could be signs the RA is affecting other systems in the body. Let your doctor know if your RA symptoms are changing at all. What Makes RA Get Worse? Different factors affect the pace and progression of individual patients’ RA. Some things you can’t control, like whether you have a family history of the disease. In addition, although women are more likely to get RA, when men get rheumatoid arthritis, their prognosis is generally worse, Dr. Bhatt says. But there are factors you can control and change. “We know smoking makes RA more aggressive, so smoking cessation is key,” Dr. Lally says. Also, people with “heavy manual occupations might stress the joints further and might have quicker progression,” Dr. Bhatt says. If your workplace can make accommodations for your disease, that will help. Read more about how to make working with arthritis easier. Exercise and maintaining a healthy weight can also help reduce stress on the joints, Dr. Bhatt says. But talk to your doctor before starting a workout regimen. “A physical therapist can advise patients on the right type of exercise,” he says. “If patients do exercises wrong it could stress the joints even further.” In addition, getting enough sleep, starting an anti-inflammatory diet, eating less red meat, and possibly using herbal remedies like turmeric may help control RA, Dr. Bhatt says. Here are more healthy habits to adopt if you have RA. Perhaps the biggest factor that affects how RA progresses is if you’re in treatment with a specialist who can put you on medications to slow the disease. “Being on a DMARD or biologic therapy for RA is the best way to prevent progression,” Dr. Lally says. Disease-modifying anti-rheumatic drugs (DMARDs) are usually the first line in medication. “Methotrexate [a DMARD] is the anchor drug for rheumatoid arthritis,” Dr. Bhatt says. “Some patients are scared because methotrexate is also used for cancer chemotherapy so they don’t want to take a ‘chemo pill,’ but those we use for RA are a very small dose with lesser chance of side effects.” Your doctor will reassess in a month or so and see if it’s necessary to add in other drugs. “If after three to six months they have still not responded then we progress to medications called biologics,” Dr. Bhatt says. These genetically engineered drugs target the inflammation process specifically, and are usually self-injected or infused via IV in your doctor’s office or a medical center. “There are sub-classes and different types,” Dr. Bhatt says. Your doctor will try various medications to see which you respond best to. Rheumatologists follow a “treat-to-target” strategy when it comes to how to manage the disease and prevent progression. This means treating the disease aggressively until a treatment target, such as low disease activity, is reached. But, Dr. Bhatt says. “there’s a balance — if we treat RA too aggressively it can cause side effects; at the same time we do not want to leave persistent joint inflammation.” Working with the level of RA control the patient wants, the ultimate goal is normal joints and minimal disease activity within a specified time frame. But patients do have to be sure to follow their treatment plan and doctor’s recommendations. “Routine follow-up with a rheumatologist who performs joint exams, follows levels of systemic inflammation in the blood and can assess function is the best way to ensure RA is being controlled and is not progressing,” Dr. Lally says. Is It Safe to Taper Biologics in Rheumatoid Arthritis Once You Achieve Low Disease Activity? How Should You Decide What RA Medication to Take Next? 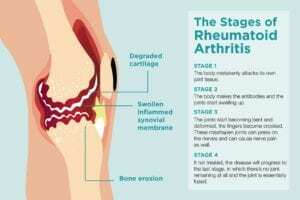 Thank you for pointing out that rheumatoid can move into the second stage without being diagnosed. I think my mother may have this form of arthritis and I’m wanting to get her the right treatment. I’ll have to do some research and find the best place for her treatment in our area.